Hello again, Pet Parents. No, you haven’t missed any of my posts; yes, I have been absent from the blogosphere for a couple months. And while being busy is no real excuse to my one loyal reader (hi, mom), the Country Club did battle the H3N2 flu virus twice and I got married and went on my honeymoon. In my internet absence and in the midst of my busyness, I did have the opportunity to learn a bunch of stuff… I learned a lot about disease prevention, pet first aid, and the dog immune system. I am basically a vet now y’all…Joking, but I did learn a lot. All that stuff I learned I won’t be discussing in this post. Womp womp. That will come later. This post is going to discuss the benefits on a well-trained dog or dogs, particularly while traveling. Some of it might come across as braggy, but I am a proud Dog Dad, and after what my pups went through they deserve a little cred. On December 9th, 2017 around 3:30 PM Mountain Standard Time, my dogs “officially” got a mom and I got a wife. For those that don’t know Sarah, she is the best, most beautiful woman and I am one lucky dog (pun intended). As you can see from the picture, our ceremony was slightly different from the norm. Tag was my Best Man and Goose was Sarah’s Maid of Honor. 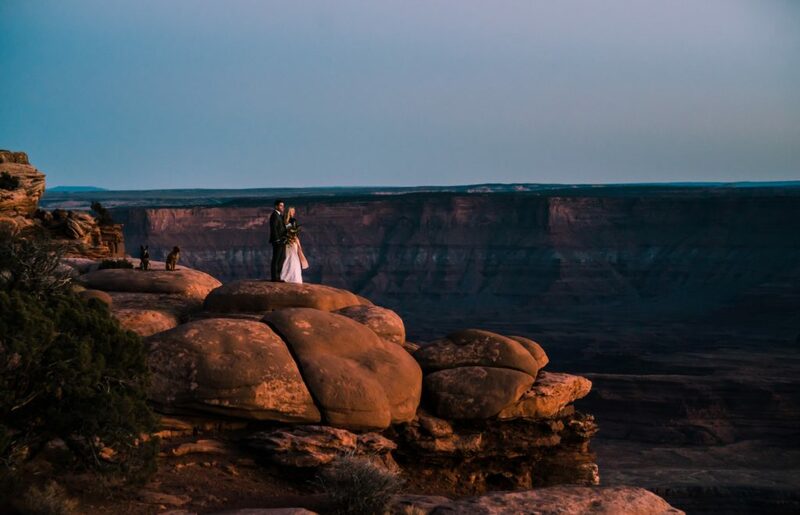 We were married at Dead Horse Point State Park in Moab, Utah. 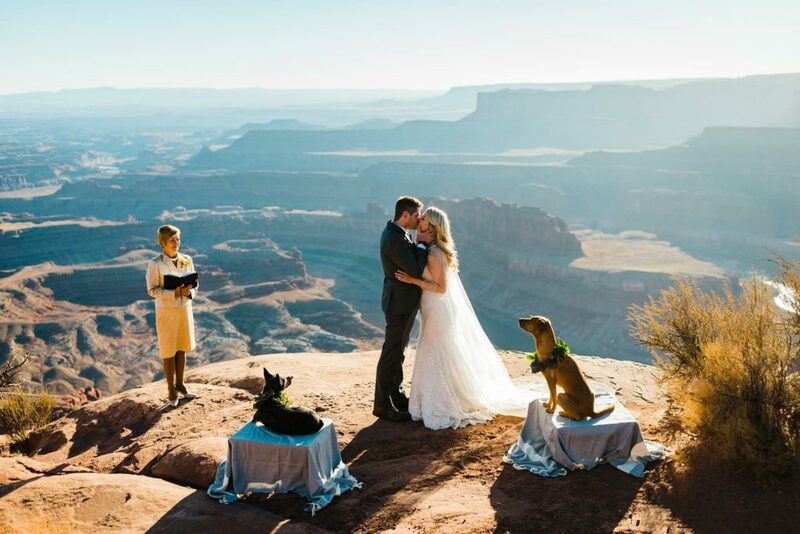 And without well-trained dogs it could have been called Dead Dog Point (imagine the Grand Canyon… with no railing). Sarah and I eloped out West and wouldn’t have had it any other way. We turned our wedding and honeymoon into one big 11 day road trip that featured stops in 9 states, 48.6 hours of drive time, and just over 3,400 miles. 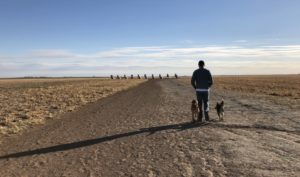 To pull off such a trip that included 5 hotels, the desert, the Rocky Mountains, wind, snow, and the occasional raindrop, PLUS two dogs, you have to have well-trained dogs. And a durable truck. The entire trip- every gas station stop, every late night potty break, every hotel lobby- was all done off-leash. For anyone with multiple dogs, this is THE DREAM. The tangled conundrums, dislocated shoulders, and being hog-tied by the leash are all too common a scene. Imagine, being able to hop out of the truck, release your dogs from the backseat and into a heel position, walk them nicely to a patch of grass (or rocks in the desert… Goose’s favorite spot), release them to go potty, and then immediately call them back once their finished and put them right back in the truck. Imagine being able to leave them in the vehicle (this was a winter trip and a hot car was not an issue) and not have them destroy the seats, or inhale the road snacks, or bark at every passerby. To walk in the hotel lobby off-leash and have them quietly sit beside you as you check-in (often the hotel staff didn’t even notice they were there). To have your dogs not run up to every dog or human that oodles over them. To leave them in the hotel room and know you can trust them to not destroy the decor or bark to the point where you disturb the other guests. This is the only way I would travel with dogs. I’m not saying that you must have off-leash obedience, but being able to trust your dog and for them to be a polite pup in public, is worth the many hours of training and consistency it takes to get there. It truly is freedom. 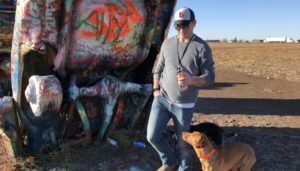 We made a stop in Amarillo, TX at a place called Cadillac Ranch. For those that don’t know, it is a big field along the interstate that has several old time Cadillacs buried vertically into the ground like a row of corn. You can spray paint these cars with whatever symbol or slogan you like. As you can see from the picture above, it’s a wide open space. As I was busy tagging one of the cars, the wind was blowing across the plains like a banshee. That wind must have carried an enticing aroma that got Tag’s feet to follow his nose. I don’t worry about him straying too far from me, as the Australian Cattle Dog breed is notorious for never being more than a couple steps from their person. Tag’s full name is Tagalong, if that tells you anything. Usually I have the opposite issue of tripping over him. But in this enormous field with the wind howling, Tag decided to venture out on his own. He was probably 300-400 yards away from me when I noticed his absence. I called for him, but the wind sent my voice backwards; he couldn’t hear me. He was getting farther and farther away. His next stop was I-40. I started to worry. What was drawing him? What if he ran onto the interstate? So then I did something that I tell my clients not to do. I took my e-collar remote and used the stim feature on a lower level. I know what you’re thinking, “he wasn’t doing anything wrong! He was in a free!” And while you are correct, I weighed the options and went back to the foundation of his training which is– feel the stim and come to me. Almost instantaneously, he 180’ed and starting running towards me. I got down low and made over him as soon as he returned. His training saved his life. Sarah is convinced that since Tag is originally from San Antonio, he knew he was in his home state and was checking to see if his old friends where nearby. Maybe grab a beer while in town or stop in to say hello. As a new husband, I know I need to pick my battles, so I let her have this one. 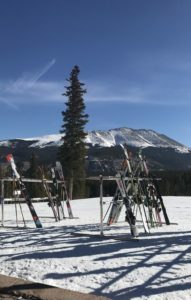 When we arrived in Breckenridge, CO to start skiing, we checked in to our hotel and started looking for the dog potty area. It was then that we found out that our hotel was literally on the side of a mountain. The potty area was literally a snow covered giant hill with a road at the top. Goose loved this hill. There were probably 6 inches of snow on it and she would dig, roll, run, and bite at all the white stuff (not yellow, thank God). It was the last day of our stop in Breck and the dogs had grown familiar with this hill and knew all the cool spots to smell. In my early morning, groggy haze I took the pups out minus their e-collars. My clients know this is a big no-no because you cannot reinforce any commands given. She goes running up the mountainside to do her thing when about halfway up, a rabbit darts out from underneath its snow fort and begins to dash up the hill. Goose, as most working retriever dogs, has a crazy high prey drive bred into them over thousands of years. Naturally, instinctively, she started the chase. It was still fairly dark outside so I could see the headlights coming down the road at the top of the hill, the rabbit running for its life, and Goose in hot pursuit headed towards the road. I gave her the recall word and prayed. I was fighting her instincts, her breeding, and her drive with just my voice. She heard the word and the angst in my tone, and turned off all those drives, and came bounding back down the hill. I was so proud of her! Once again, the training paid off and crisis was averted. This trip was the culmination of countless hours of training, consistent reinforcement, and the love of dogs. I know this blog contained a lot of things I did wrong (do as I say, not as I do, right? ), but Tag, Goose, and I were able to overcome those missteps because of all the training we did right. I am still human and am not the perfect dog trainer or owner, but my pups showed that through consistency and repetition, they can handle a cross-country trip. I can get married cliffside and trust their obedience to not fall over the edge. It’s an amazing feeling having your four-legged family members be a part of such a special occasion. You and your pup can have this too. Just give us a call at The Pet Station Country Club to start your training journey.